A dog sprawled out in the grass, panting heavily, tongue out to the side, tennis ball between front paws - basking in the glory of a successful game of fetch. Three grizzly bear siblings tumbling and swatting playfully in a lush Alaskan meadow, ignorant (or defiant) of their mother's watchful eye. And, of course, a tiger relishing the first experience of submerging in a cool, refreshing pool of water. Recently I made my first visit to Safe Haven Rescue Zoo, a GFAS-verified wildlife sanctuary located in a very remote part of Nevada. Nestled in a high desert valley, guarded on all sides by towering mountain peaks, Safe Haven embodies an oasis. While with ample peace and quiet, this sanctuary is subjected to extreme sun exposure and intense heat during a large portion of the year. Many sanctuaries, including Safe Haven, provide pools in the form of metal troughs, which is a wonderful and usually the most affordable option available. However, Nevada's harsh sun poses a problem to this common practice. As someone who grew up in the desert, I can tell you that in the heat of a summer day, you slowly and delicately fasten your seatbelt because this is the time of year you avoid metal at all costs. Getting into a metal pool that has been baking in the sun for a few hours doesn't exactly provide the intended relief. Safe Haven realized this flaw and has since been devoted to finding a solution. What they needed were in-ground pools. Larger pools require more water, and Safe Haven identified yet another opportunity for a "green" initiative, as they are already almost completely powered by solar. They will recycle the pool water to irrigate grassy areas in the enclosures to provide areas of soft contrast from the naturally hard soil. After IFAW provided a grant to cover the costs of the cement for five in-ground pools, Lynda and Dave Sugasa, the founders of Safe Haven, invited us to visit the sanctuary and witness the reveal of the first completed pool to two tigers particularly special to me, Carli and Lily. These girls were among the 19 exotic animals we helped confiscate almost a year ago from a failed facility in New York. It is always exciting and satisfying to rescue and remove animals kept in deplorable conditions, but to see them later, well-adjusted in their new environments is rewarding beyond words. 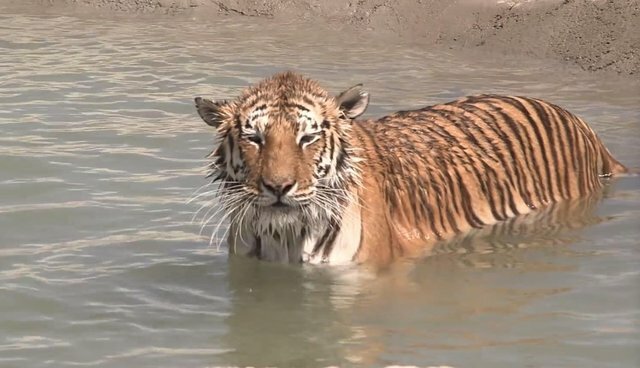 I can't imagine a better gift from a tiger than the smile it gives me to watch her dunk her head under water, shake the droplets from her fur, and peer up at the sky with pure joy. I hope you'll feel that same joy as you watch the video and be proud to know your support not only takes away the bad but introduces the good. I hope you'll feel that same joy as you watch the video and be proud to know your support not only takes away the bad but introduces the good. From Carli and Lily, and all the animals you help us rescue, thank you.